Soft Pastel on Pastel Paper. This is one of the first soft pastel paintings I have done in a few years. Illness and family history work have kept me busy. Now I am counting the days until I can buy more paper and pastels. This painting is created on one of the new pieces of Pastelmat I bought from the UK. So far I love Clairefontaine Pastelmat the best of any pastel paper I have found, especially since Wallis Paper does not seem too be around any more. There is a certain enchanting beauty about a heavy snowfall on evergreens at the end of a winter’s day. I wanted to capture the peaceful quality of a northern Canadian landscape since this is where I’m from and we certainly have had a peaceful and long winter this year, which has brought several inches of snow although I am getting rather tired of the snow at this point in the year. 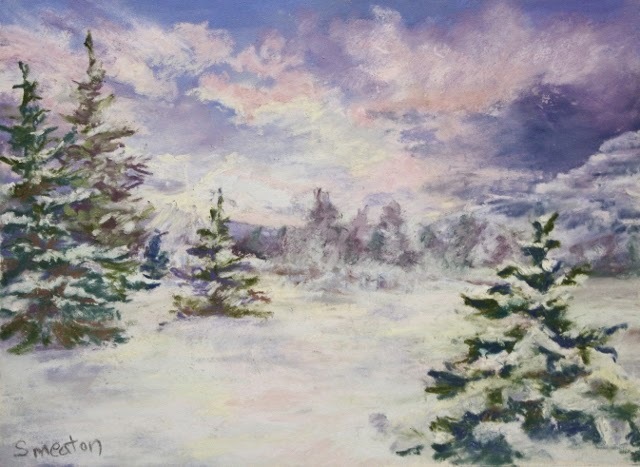 This will probably be the last snow painting that I depict for a bit and plan on painting other subjects including a few spring landscapes if I can find the proper references or the wherewithal to paint. I rarely talk about the actual application of the pastel however it might be interesting to some so…Many pastelists like to use harder pastels in the beginning and layer the softer ones over top however I don’t really like the hard pastel I have well enough to use them so I move straight to the Girault which are medium hard to the really soft one’s like Ludwig and Unison and keep layering until I either achieve what I want or I run out of layering surface. I don’t bother with an under-painting or anything fancy. It’s better to concentrate on things I need to work on improving such as the values changes, composition and color application. It’s the time of year when winter seems to be lessening it’s grip on this part of the world and the fluctuations of temperature are prominent and the atmosphere seems to soften and grow a little less frosty. 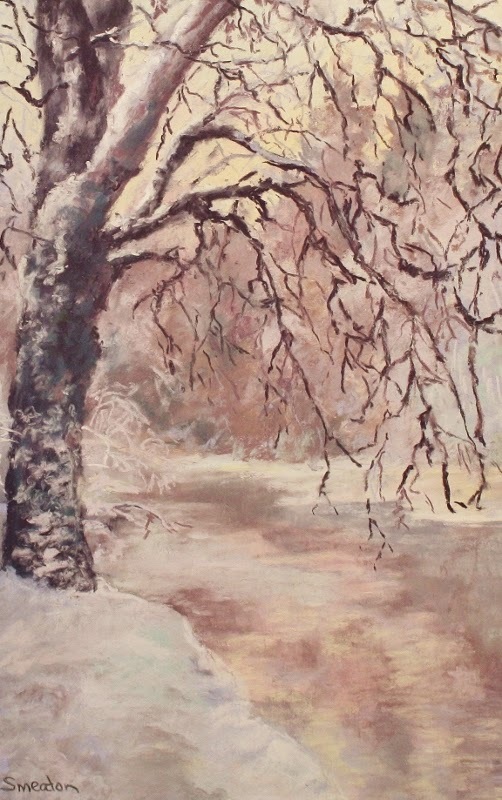 I notice the soft apricot glow of the morning sunrise and wanted to capture that quality in the winter painting. I also like how the tree creates a nicely arching habit which creates an almost circular movement around the piece. 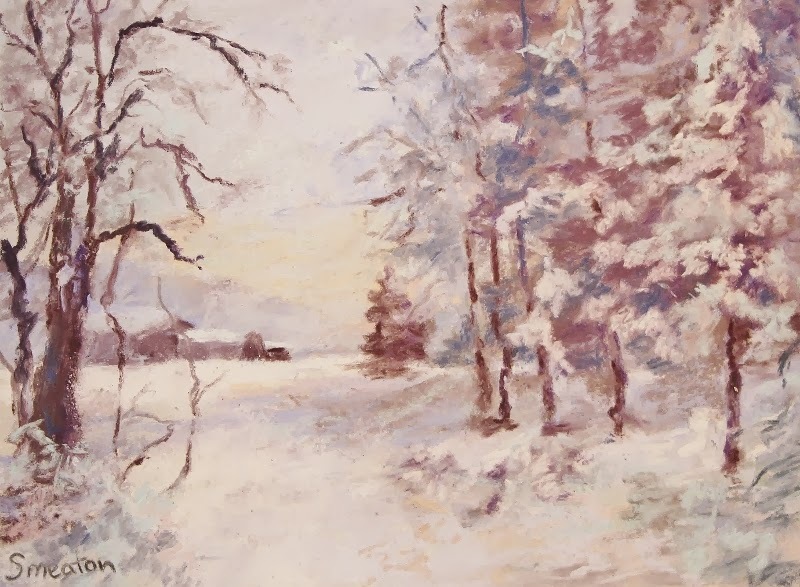 I was also careful to simplify the color scheme to capture the subtle tonal value changes often seen in the winter months along with the soft light of early morning. This work is also about forms and how they relate to one another to create a sense of drama. 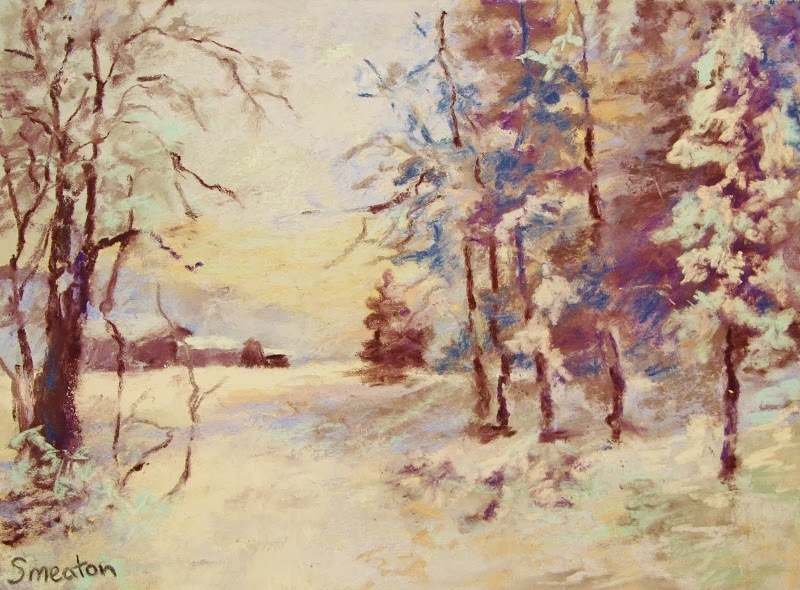 I used artist quality pastels including Unison, Terry Ludwig and Girault on acid free Wallis Pastel Paper. A Cold Winter's Morning, Pastel on Pastel Paper, 12x18"
I live near a wetlands area connected to the river system and a large lake so there are many different forms of interesting wildlife in this area too that this precious habitat supports. I wanted to capture the essence of this natural setting in one of my few wetland paintings and the first one that I have done of this type of landscape in the winter season. 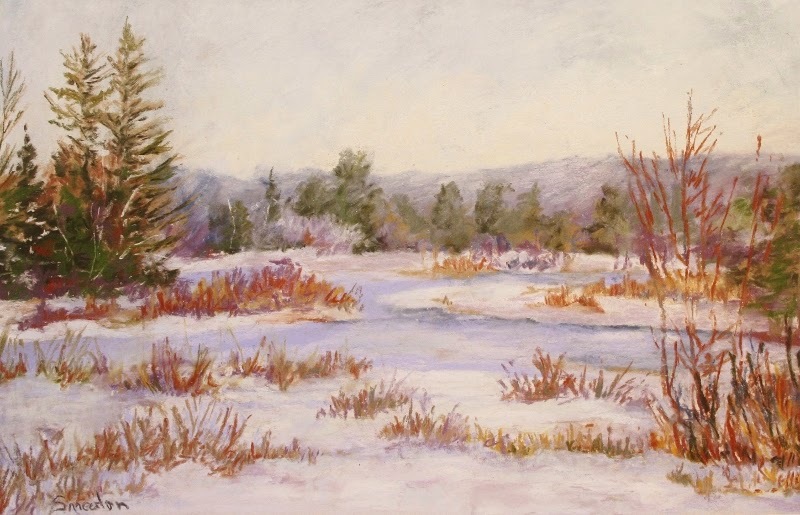 In fact I seem to be exploring the theme of water and wetlands in the winter season just lately and have completed three pastel paintings describing this type of habitat in the snow. Winter Marsh, Pastel on Wallis Paper, 12x18"
I first picked up oils again about four years ago and this was one of the first paintings that I did and actually liked and triggered a memory of a natural landscape which I can’t quite identify which leaves me with a feeling of nostalgia. It has been hanging on a wall in my house ever since I finished it and I finally decided to part with it and try to sell it online. An artistic teacher had said something about how artists don’t try to paint mist and fog in their landscape paintings often enough and these atmospheric weather conditions have always held a certain attraction for me so I try to do this periodically and this was one of the first oil paintings where I practiced this. I used artist grade Windsor and Newton oil paints on a pre-stretched canvas which is also an artist grade support. 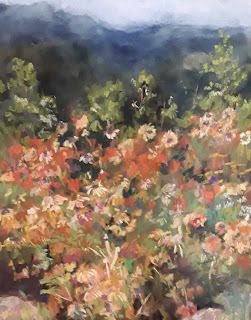 After about a year and a half of painting with oils I found soft pastels and enjoy using them since they require less clean up and you get finished results much sooner or at least I usually tend not to play around with pastels as much as the oils. I also needed to put the oils down since lifting the brush up and over the level of my shoulder was painful and the whole arm would go numb and the shoulder joint would hurt like crazy! I’m hoping that the shoulder will permit me to pick up the oils again if I should feel the lure of the brush again. I pulled the oils out recently and looked them over however the desire to use them didn’t quite hit me yet hopefully it will in the future and I would like to develop a more mature style with the soft pastels as well. 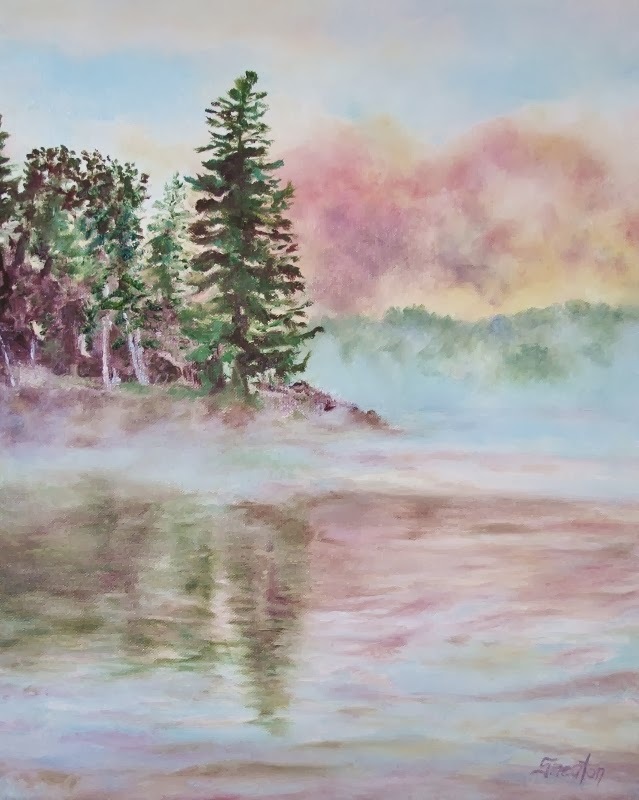 Morning Mist on a Northern Lake, Oil on Canvas, 16x20"
A Winter's Evening, Pastel on Pastel Paper, 9x12"
I’ve been concentrating on painting a few winter scenes lately since we have a white winter this year like we are supposed to here in Canada and it has put me in the mood to depict this type of scenery. I wanted to capture a scene at the end of a winter day so there are some warm tones in the snow which are being cast by the setting sun. I wasn’t happy with the finished painting and neither was I happy with the photograph and think that I need a new camera. I don’t like the gold light higher up behind the trees either. I also think that there should be more violet and blue shadows in the foreground to the right side of the picture. That bright blue color in the tree’s might be a little intense too. Maybe continue the snow covered shrubbery to the bottom of the painting on the left side. I made a few changes as described and I think that this work has improved. I also was careful to adjust the photo on the computer so the contrast wasn’t as sharp and more like the actual painting. I also tried to adjust the photo so the colors were more like the actual painting although the colors are a little too soft perhaps. I love old growth forests and wish there were more of them left around and these two pine trees seem like they might be part of one such forest which is almost perceivable in the background through the mist. I used cool tones of greens, violets, blues and grays to capture the peaceful, lush , wet and somewhat haunting atmospheric mood of this scene. I used Terry Ludwig and Unison pastels on Wallis Pro White Pastel Paper. 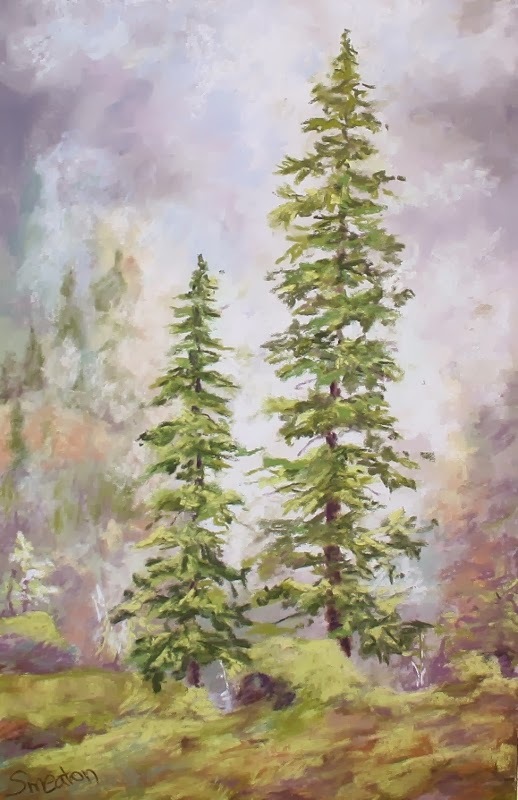 Pine's In the Mist, Pastel on Pastel Paper, 12x18"
Do not use my images.. Simple theme. Powered by Blogger.